It seems to be a new trend now of aluminum cases for the iPhone 4, many companies are emerging in a rapid paste to make their version of machined aluminum cases that have a bumper style to them. 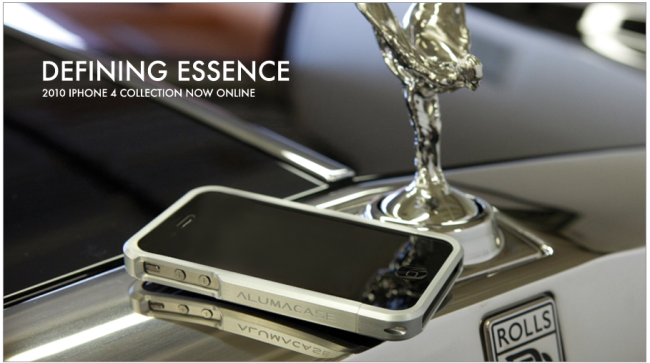 While ElementCase has been one of the first to out their Vapor case for the iPhone 4, many others jumped on the idea and today Alumacase, are starting out as an aluminum iPhone 4 case manufacturer. Alumacase will begin taking orders of their new aircraft grade aluminum iPhone 4 cases very soon for $59.95 in a slew of colors. Alumacase also offers real carbon fiber backings that are made to work with their cases for just $13.95 a pop.